Connects the parameter to another Value Node. Implementation for this layer. References synfig::Layer_Polygon::clear(), f, SET_INTERPOLATION_DEFAULTS, synfig::ValueBase::set_list_of(), SET_STATIC_DEFAULTS, and TYPE_SHARP. 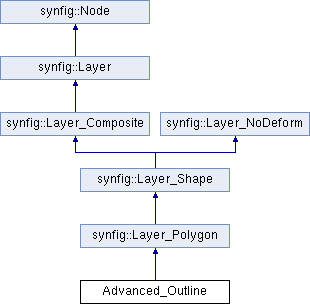 References synfig::Layer_Polygon::add_polygon(), bline, synfig::bline_length(), synfig::Layer_Polygon::clear(), CUSP_TANGENT_ADJUST, EPSILON, synfig::error(), synfig::ValueBase::get(), synfig::Layer::get_description(), synfig::ValueBase::get_list(), synfig::ValueBase::get_list_of(), synfig::ValueBase::get_loop(), synfig::Layer::get_parent_canvas_grow_value(), synfig::WidthPoint::get_position(), synfig::hom_to_std(), synfig::Vector::is_equal_to(), N_, synfig::Vector::norm(), synfig::Vector::perp(), SAMPLES, synfig::WidthPoint::set_position(), synfig::std_to_hom(), TYPE_SHARP, synfig::warning(), synfig::widthpoint_interpolate(), and zero(). References _, synfig::Layer::set_description(), TYPE_BEVEL, TYPE_ROUNDED, and TYPE_SHARP.